The Environmental Impact of Washington’s Marijuana Packaging – Cannabistical: of or concerning cannabis. If you have purchased marijuana in Washington State, you’ve probably noticed the packaging can be difficult to open and is adorned with warnings, bar codes, and lots of other information that appears in tiny font. This is by design, as the state has created robust regulations intended to protect the public from contaminated cannabis and to limit access by children. Though these regulations are important, one has to ask what impact these packaging requirements have on the environment. Washington’s packaging and labeling requirements can be found in WAC 314-55-105. Note that this section of the Washington Administrative Code was recently amended meaning that there are two separate packaging standards. Licensees can abide by the old rules until January 1, 2019 when the new version of WAC 314-55-105 go into full effect. Until that date, licensees have the option to comply with the new rules. This post will focus on the newer version of WAC 314-55-105. All containers that carry marijuana must protect the substance from contamination and harmful substances. Marijuana-infused products, such as edibles, and marijuana concentrates must come in child-resistant packaging. For packages containing more than one serving (a serving is capped at 10 milligrams of THC) of a solid edible product, each serving must come in child resistant packaging. For liquid products, the packaging must include a measuring device such as a cap that you would find accompanying a bottle of NyQuil. Hash marks on the side of a package are not enough. Warning – May be habit forming. Unlawful outside Washington State. It is illegal to operate a motor vehicle while under the influence of marijuana. Per the recent rule change, all marijuana products must also include Washington’s marijuana universal symbol (pictured below). In addition, the label must include the business or trade name and UBI number of the licensed producer and processor, the traceability identifying number, the number of servings (if applicable), the net weight, and THC and CBD concentrations. Marijuana concentrates or infused products intended for inhalation must list the solvents used to create product, state the method of extraction, and disclose whether any other chemicals or compounds were used. Marijuana infused products intended for consumption must also list information about extraction methods and solvents, in addition to listing food allergens and the following sentence: “CAUTION: intoxicating effects may be delayed by 2+ hours.” Additionally, edible marijuana products must include the “Not for Kids” logo, shown to the right. Marijuana topical products must contain the statement: “DO NOT EAT” in bold, capitol letters. Required on edibles in Washington State. 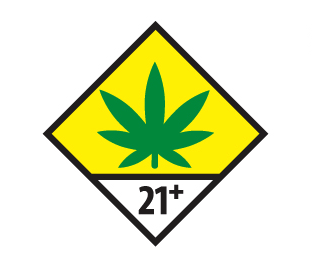 single-serving edibles must come with enough packaging to include the two logos, written warning, and information on the licensees and product. In addition, businesses making the product also want to include their branding and marketing material, which also takes up space. That branded packaging is important for producers and processors who are trying to stand-out and earn valuable shelf-space in retail stores. Unfortunately, all of that packaging has to go somewhere and it often ends up on the street or sitting in a dump. Last month, journalist Kristen Millares Young wrote about the waste generated by Washington’s cannabis market in an article for the Washington Post. Young highlighted that environmental groups are increasingly finding cannabis packaging on the streets, something I can personally attest to living here in Seattle. The article also highlights the problem with “doob” (as in doobie) tubes, the plastic tubes used to package pre-rolled joints. These tubes cannot be recycled, even when made of recyclable plastic, because they fall through the grates of recycling machines. Washington’s waste problem doesn’t have a simple solution. As Young points out, a potential “fix” would for Washington to require that producers and processors use recyclable material for the purpose of packaging. However, that would add increase costs to producers and processors who are already struggling to operate in a fiercely competitive market where the number of producers and processors far outweighs the number of retailers. Perhaps it’s time to reconfigure Washington’s labeling requirements. The newest version of WAC 314-55-105 allows producers and processors to provide some information that used to be required on the physical package online. This may allow for more streamlined packaging, putting less of a burden on Washington landfills. After all, a QAR code can provide a vast amount of information without taking up much space. If you’re a consumer you have some options. First, you can contact the Washington State Liquor and Cannabis Board about its rules, either online or during their monthly board meetings; and you can call your state representative to voice your concerns. Second, you can purchase products that have less packaging, such as marijuana flower rather than pre-rolls packaged in tubes, and you can reward companies that do use recyclable materials by purchasing their products. Third, you can make an increased effort to recycle your discarded packages and reuse non-recyclable packages. For example, maybe save the doob tube and use it to transport your hand-rolled joint in the future.